With seven lead changes in the first three quarters, Tippecanoe Valley took a 29-28 lead into the final stanza. Manchester used an 8-2 run to lead 37-31 and hit 8-10 free throws in the final 2:20 for a 43-40 lead. Valley had one final chance to tie the game but missed at the buzzer. Kennedy Fierstos led Manchester with 22 points, followed by seven points from Eva Bazzoni and five from Emma West. The win gave the Squires their first conference title since 2012. For Northfield, the Lady Norse built a 33-11 lead by the half and coasted to victory over the Lady Zebras. three steals, and Kelcie Thomson added 12 points, four assists, six rebounds and four steals. Monday night, the Lady Norse defeated Whitko 63-25 on senior night. Northfield led 33-17 at the half and outscored the Lady Wildcats 30-8 in the second half. Ariel Dale finished with 11 points and three assists, and Emma Hoover added 11 points. Kelcie Thomson contributed 10 points, five assists, six rebounds and seven steals, and went over the 1,000-point mark for her career in the win. Kyra Kennedy had 10 points and four rebounds, Abbey Ross added eight points, three assists and five rebounds, and Ally Keaffaber finished with seven points and two rebounds. Southwood’s girls basketball squad fell to Tippecanoe Valley 74-33. The Lady Knights trailed 33-20 at the half, and were outscored 41-13 in the second half. MaKenna Pace finished with eight points and four rebounds for Southwood, while Morgan Farr added eight points, three steals and two assists. 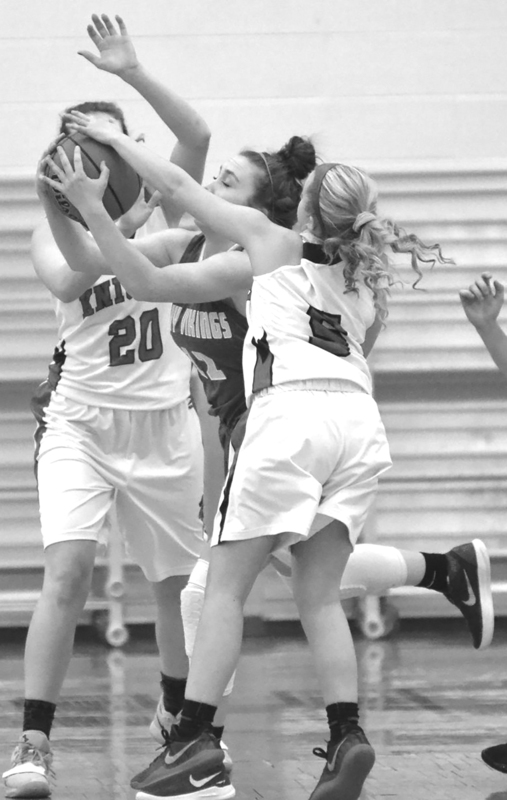 Southwood’s girls basketball team suffered a 43-37 loss to Southern Wells on Wednesday night to fall to 4-17 on the season. The Lady Knights took a 28-27 lead into the fourth quarter, where they were outscored 16-9. MaKenna Pace led Southwood with 12 points, seven rebounds and three steals. Erin Lehner added eight points and two steals in the loss. Southwood’s girls basketball team suffered a 72-35 loss to North Miami in its regular season finale, dropping to 4-18 (1-9 TRC) on the season. The Lady Knights were outscored 41-16 in the second half of the loss. MaKenna Pace led Southwood with 17 points, four rebounds and three steals, and Erin Lehner added six points, three assists and two steals. Manchester’s girls basketball team picked up its fifth straight win, 41-29, over Bluffton Tuesday night. The Lady Squires (14-7) outscored the Lady Tigers 15-2 in the second quarter to take a 23-9 lead into the half. Kennedy Fierstos led Manchester with 10 points, four rebounds and two steals. Kiera Hatfield added nine points, three assists and two steals, and Kennidy Lauer added seven points and three steals. 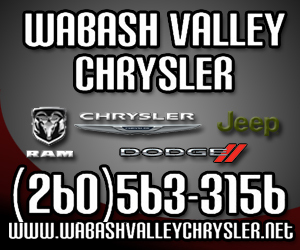 Wabash’s girls basketball team suffered a 48-46 loss to Peru Wednesday night to fall to 8-12 on the year. The Lady Apaches held a 36-25 lead headed into the fourth, but were outscored 23-10 in the final stanza. Wabash was led by Alivia Short, who finished with 15 points and 12 rebounds, and Mariah Wyatt added 10 points and 10 rebounds. 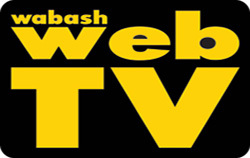 Wabash’s girls basketball team was defeated by Whitko 46-33 Friday night. With the score tied at 31-31 headed into the fourth quarter, Whitko outscored Wabash 15-2 in the final stanza to take the win. Alivia Short led the Lady Apaches with 19 points and eight rebounds. Wabash’s girls basketball team bounced back from tough losses earlier in the week with a 46-44 win over North Miami Saturday to close out the regular season with a 9-13 record. The Lady Apaches held a 21-20 lead at the half, and outscored the Lady Warriors 25-24 in the second half. Wabash was led by Mariah Wyatt with 18 points and 15 rebounds, while Alivia Short added nine points and 14 rebounds. Northfield’s boys basketball team defeated Tri-Central 70-51 Tuesday night. The Norse outscored the Trojans 28-8 in the middle quarters, then scored 30 points in the fourth quarter to help seal the win. Jared Peas scored 12 points to lead the way for Northfield. Logan Peas and Nate Drancik both finished with 11 points and five rebounds, and Graydon Holmes added 11 points and seven rebounds. Clayton Tomlinson rounded out the Norse leaders with six points and a career-high 11 assists. Northfield dropped a close TRC matchup with Rochester Friday night, 59-55. The game featured seven ties and 11 lead changes. Jared Peas led the Norse with 27 points, and added five rebounds and five steals. Clayton Tomlinson added 11 points in the loss. Northfield’s boys basketball team picked up a 57-41 victory over Caston Satuday night to improve to 4-11 on the season. The Norse outscored the Comets 31-18 in the second half to blow open a close game. Clayton Tomlinson led Northfield with 19 points, including five 3-pointers, and seven steals. Logan Peas finished with 11 points and nine rebounds, and Nate Drancik added 10 points. Manchester’s boys basketball team defeated Bellmont on the road 56-52. The Squires led 30-27 at the half, and outscored the Braves 11-5 in the third quarter before holding on for the win in the fourth quarter. Weston Hamby led Manchester with 22 points in the victory. Thane Creager added 16 points and four rebounds. Manchester’s boys basketball team defeated Tippecanoe Valley Friday night, 60-49. The Squires outscored the Vikings in every quarter to gradually extend their lead. Weston Hamby led Manchester with 21 points, four rebounds, five assists and two steals. Thane Creager added 19 points in the victory. Manchester’s boys basketball team was defeated by Fort Wayne Concordia 46-38 Saturday night. The Squires trailed 24-19 at the half, and were outscored 22-19 in the second half. Weston Hamby led Manchester with 17 points, and Kam Lester added nine points seven rebounds. Southwood’s boys basketball team defeated North Miami 83-57 Friday night to improve to 5-9 on the season. The Knights took a 41-33 lead into halftime, and then outscored the Warriors 19-6 in the third quarter. Dallas Holmes led Southwood with 33 points, seven steals and seven rebounds, Jackson Simons added 13 points, eight rebounds, six steals and two blocks, and Gabe Lloyd added nine points and six rebounds. Wabash’s boys basketball team used a big second quarter to overtake Bluffton in a 69-43 win over the Tigers. The teams were tied 13-13 at the end of the first quarter, but the Apaches outscored the Tigers 17-6 in the second quarter to begin to pull away. Wabash outscored Bluffton 39-24 in the second half. Logan Vander Velden led the Apaches with 17 points and nine rebounds. Trenton Daughtry added 15 points, five rebounds and three steals, and Jared Holley contributed 13 points and three steals. Wabash’s boys basketball team routed Southern Wells 80-35 Saturday night to improve to 12-1 on the season. The Apaches jumped out to a 46-13 lead by the half and never looked back. Trenton Daughtry led Wabash with 19 points, five rebounds, four steals and six assists. Dereck Vogel added 16 points and three assists, and Jasper Walters and Blake Gribben both scored 10 points. Emmanuel Christian School’s boys basketball team defeated Grace Baptist Friday night 63-41. J.C. Frank led the Eagles with 23 points, Levi Hinds added 10 points and Jack Niccum finished with nine points. Emmanuel also defeated Heritage Hall in Muncie, 58-23. Hinds scored 17 to lead the Eagles. Preston Ritzema finished with 13 points and Frank added 11. The Wabash girls swimming team suffered a 127-54 loss to Bluffton Monday night. Becca Bruss placed first in the 100 backstroke, and the 400 freestyle relay team of Mallory Hipskind, Chasity Honeycutt, Olivia Lindsay and Bruss were also victorious. Leigha Boggs took second place in diving, and Lindsay was second in the 100 butterfly. The Wabash girls swimming team defeated Elwood Wednesday night, 110-50. Becca Bruss broke her own school record in the 200 individual medley, while Bruss, Mallory Hipskind, Chasity Honeycutt and Olivia Lindsay broke the 400 freestyle school record. The 200 medley relay team of Grace Schoening, Leigha Boggs, Lacey Christ and Lucia Olalla was victorious. Lindsay won the 200 freestyle and the 100 butterfly, Hipskind won the 100 freestyle, and Evelynn Gray won the 500 freestyle. The 200 free relay team of Bruss, Hipskind, Lindsay and Honeycutt were victorious, Bruss won the 100 backstroke, and Crist won the 100 breaststroke. The Wabash boys swimming team was defeated by Bluffton 134-45 Monday night. The Apaches did not have an individual winner, but did have quality swims out of Michael Cordes in the 200 freestyle, Jonah France in the 50 freestyle, and Taylor Coffman and Paul Cordes in the 400 freestyle. The Wabash boys swim team defeated Elwood 121-35 on Wednesday night. The 200 medley relay team of Ryan Evans, Cody Henderson, Michael Cordes and Jonah France was victorious. Michael Cordes won the 200 freestyle, Kyle Thomas won the 200 individual medley and 100 butterfly, and Peyton Sluss was victorious in diving. Taylor Coffman was victorious in the 500 freestyle, and the 200 freestyle relay team of Michael Cordes, Paul Cordes, Henderson and France took top honors as well. Evans won the 100 backstroke, Henderson won the 100 breaststroke, and the 400 freestyle relay team of Paul Cordes, Evans, Coffman and Thomas came out on top as well.